Augusta is just around the corner in a few weeks, but the 2019 PGA Tour first makes an important stop at the Copperhead Course at Innsbrook Resort in Palm Harbor, Fla., for the 2019 Valspar Championship. This Par-71 course will host big names such as Dustin Johnson, Sergio Garcia, Jon Rahm and Jason Day this weekend, with Johnson going off as the heavy favorite at 11-2 in the latest 2019 Valspar Championship odds. Day and Rahm come in next at 10-1, while former major winners Bubba Watson (40-1) and Henrik Stenson (35-1) are among the long shots in the field. Before locking in any 2019 Valspar Championship picks of your own or entering a daily Fantasy contest on a site like FanDuel or DraftKings, first check out the PGA Tour predictions from the golf model at SportsLine. 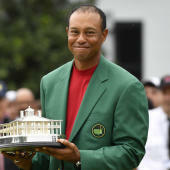 SportsLine's prediction model, built by DFS pro Mike McClure, has nailed four of the last eight majors entering the weekend and called Tiger Woods' deep run in the PGA Championship despite being a 25-1 long shot. The model has been spot-on early in the 2018-19 season. It was high on champion Rory McIlroy at the 2019 Players Championship, projecting him as one of the top two contenders from the start. It also correctly predicted Brooks Koepka's (9-1) victory at the CJ Cup earlier this season. Additionally, it nailed Bryson DeChambeau's (9-1) seven-shot victory at the 2019 Omega Dubai Desert Classic. Anyone who has followed the model is way up. Now that the 2019 Valspar Championship field is locked, SportsLine simulated the event 10,000 times, and the results were surprising. One huge shocker the model is calling for: Sergio Garcia, one of the Vegas favorites, stumbles this week and finishes outside the top 5. Garcia has finished inside the top 10 in two of his four PGA Tour starts this season. And he's also proven he can play well at Innisbrook's Copperhead Course, finishing in fourth place last year after shooting a final round 65. However, Garcia's last PGA Tour victory came all the way back at the 2017 Masters. He also enters this week's event hitting just 58.48 percent of fairways off the tee, which could cause major trouble at the lengthy Copperhead Course at Innisbrook Resort. He's not a strong pick to win it all and there are far better values in this loaded field. Another surprise: Another surprise: Webb Simpson, a 20-1 long shot, makes a charge at the title. He has a much better chance to win it all than his odds imply, according to the model, so he's a target for anyone looking for a huge payday. Simpson has multiple impressive performances this season on tour, recording a third-place finish at the RSM Classic and a T-8 at the Sentry Tournament of Champions. He's been consistent as well, making the cut in every tournament he's been in this season. He also shot a 68 in the final round of the Players Championship, so he comes to Palm Harbor with some momentum. Simpson is ranked 23rd on tour in driving accuracy percentage at 68.7. That puts him in favorable situations, but with a sand-save percentage of almost 70 percent, he's also shown the ability to get out of tough ones. He can climb the 2019 Valspar Championship leaderboard in a hurry and should be squarely on your radar as you search for value picks. Also, the model says five additional golfers with Valspar odds of 20-1 or longer make a strong run at the title. Anyone who backs these underdogs could hit it big.